Rod Egan’s and John Kruse’s Worldwide Auctioneers established a beachhead on the Monterey Peninsula this year, taking an early position on the now only four-day schedule with a Thursday afternoon date. Pacific Grove is Worldwide’s second new venue this year after entering the fray in Scottsdale in January. Pacific Grove came only two weeks before Worldwide’s established Auburn auction, too, a Mecum-esque high intensity sequence that put particular demands on the site management of John Aguilard and his team. They pulled it off with barely a hitch. Setting up a new auction venue is a challenge, particularly when it happens in temporary tents on a green field site, and to stage it smoothly requires minute attention to detail and military-like precision. 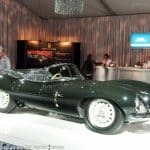 On that basis alone, Worldwide’s Pacific Grove auction was a success, and one that benefited from easily the most picturesque location in Monterey. The 73-car consignment was small, but consistent with the one-day format. The 67.!% sale rate was good for a first-time sale and the average and median transactions showed a quality consignment, being better in all three categories (sell-through, average and median) than established Monterey players Russo and Steele and Mecum. Had two or three important cars sold the numbers would have been even better. But that can be said of nearly every auction. Worldwide says they’re in Monterey for the long haul. They’ve secured a particularly attractive location and proved to be competitive out of the box. They bring a fresh element to the Monterey Car Week auctions. Andrew Newton and Greg Ingold contributed many of the on-site descriptions. The final copy and comments are my responsibility. The cars that follow are sorted by Marque, Model, Body and Year for quick reference and comparison. Lot # 33 1959 AC Ace Roadster; S/N BEX447; Dark Blue/Dark Red vinyl; Estimate $225,000 – $275,000; Modified restoration, 3 condition; With Reserve; Hammered Sold at $200,000 plus commission of 10.00%; Final Price $220,000. – 289 Ford V-8, chrome wire wheels, 185/70-15 Vredestein tires, wind wings, Moto-Lita woodrim steering wheel. – Good older paint, chrome and interior. Engine compartment is workmanlike. A driver quality conversion that may still be shaking down. – This may be an even better avenue to the Cobra experience than a Sunbeam Tiger with an Ace that was, like so many of its brethren, converted to 289 Ford power. It brought a little more than an AC-engined Ace in comparable condition, an understandable result. 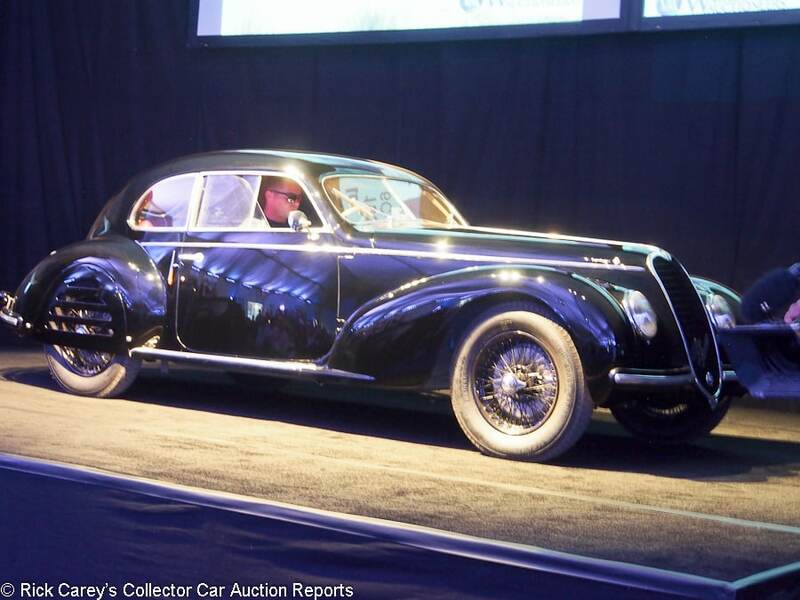 Lot # 26 1939 Alfa Romeo 6C 2500 Sport Berlinetta, Body by Touring; S/N 915005; Engine # 923880; Black/Red leather; Estimate $1,800,000 – $2,400,000; Older restoration, 2- condition; With Reserve; Not sold at Hammer bid of $1,300,000. – RHD. Black Borrani wire wheels, Excelsior tires, slotted fender skirts, sliding side windows, Bosch headlights, seat belts. – Known history since 1946, one of five believed built with the triple carburetor SS engine. Restored by Touring several years ago. Very good paint, interior and major chrome Pitted body side chrome. Crisp gauges and dash. Lightly scuffed aluminum side window frames. Orderly but oily engine compartment shows use. A beautiful car that should be a delight to drive. – This is a beautiful automobile both outside and under the hood, with a quality older restoration that still looks good. While it would be good to see it go home with someone who will use and enjoy it, the seller’s decision that it is worth more than the reported high bid is understandable. 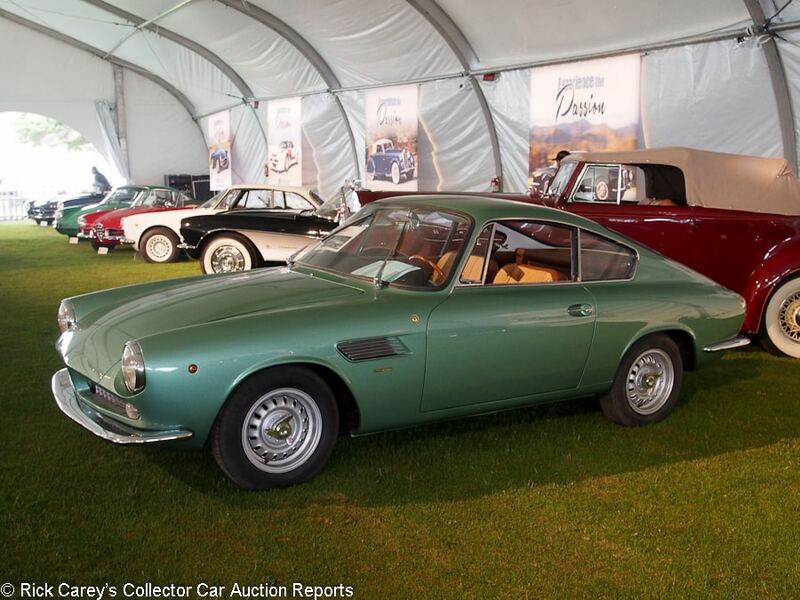 Lot # 12 1963 ASA 1000 GT Coupe, Body by Bertone; S/N 01022; Engine # 173551; Light Green/Tan leather; Estimate $125,000 – $150,000; Recent restoration, 2 condition; With Reserve; Not sold at Hammer bid of $90,000. – 5-speed, Borrani centerlock alloy wheels, Pirelli tires, woodrim steering wheel, original 4-speed (and a spare windshield) are included. – Very good paint, chrome and interior. Very clean underneath. Light scratches on the original steering wheel. Fully restored in 2014. One of only a few dozen of these ‘Ferrainas’, which were four-cylinder coupes that had much of the design work done by Ferrari before production was licensed out. Production figures vary depending on the source, but less than 100 were built. – It may have less than 100hp, but the ASA is a very rare little car that has a strong connection to both Ferrari and Bizzarrini as well as Giugiaro-penned bodywork. For the consignor to expect a price on the other side of six figures is understandable. 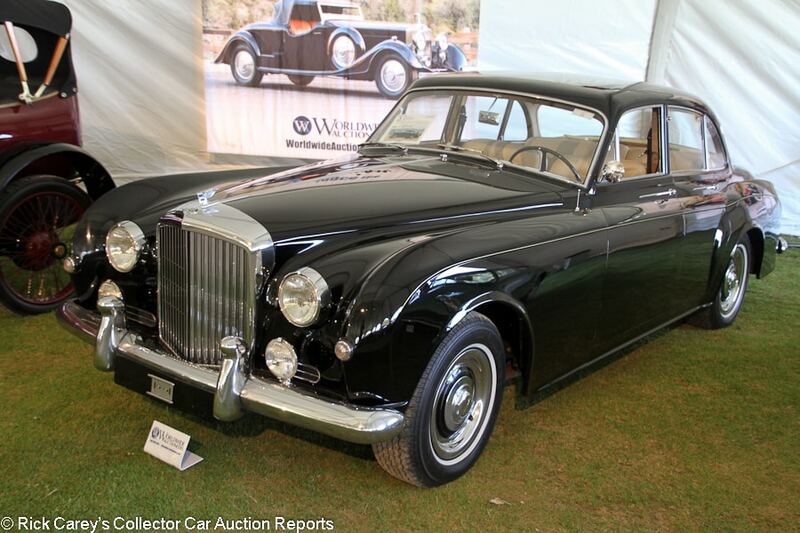 Lot # 36 1961 Bentley S2 Continental Flying Spur, Body by James Young; S/N BC41LBY; Black/Magnolia leather; Estimate $290,000 – $340,000; Visually maintained, largely original, 3+ condition; With Reserve; Hammered Sold at $240,000 plus commission of 10.00%; Final Price $264,000. – Wheel covers, Avon narrow whitewalls, Flying B, Lucas driving lights, aftermarket air conditioning front and back, Motorola pushbutton radio, column shift. – Uneven door gaps. Some paint flaws and orange peel on the B-pillars but otherwise good older paint and chrome. The wood is in great shape around the doors but the finish is cracking on the dash. Lots of wear underneath. Sold new in Switzerland. Never fully restored but has gotten attention when necessary. – Sold by Sotheby’s in Zurich in March 1993 for $49,201 and at Auctions America Santa Monica in 2015 for $204,000. The result here is a good one for the seller without disadvantaging the new owner with an excessive price. 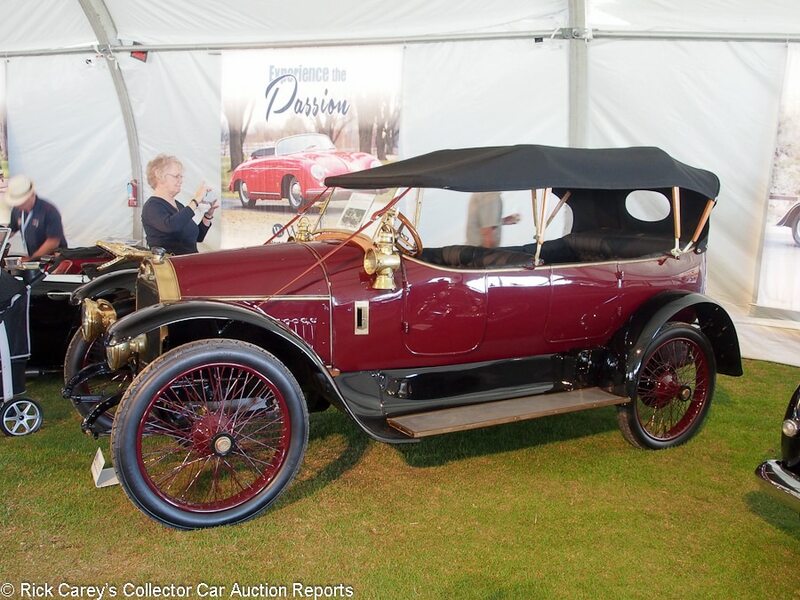 Lot # 30 1912 Benz 8/20 HP Tourer, Body by Thompson’s Pty. Ltd.; S/N 5450-15337; Engine # 15337; Maroon, Black fenders/Black leather; Black cloth top; Estimate $175,000 – $225,000; Older restoration, 3+ condition; With Reserve; Hammered Sold at $110,000 plus commission of 10.00%; Final Price $121,000. – RHD. Maroon wire wheels, 825×105 Excelsior tires, boa constrictor horn, single sidemount, H&B kerosene sidelights, Herm. Riemann acetylene generator and headlights, folding windshield. – Coachwork by Australian firm Thompson’s Pty. Restored in the mid-80’s, then re-restored last year. Good older paint, upholstery and top but the brass needs lots of Never Dull and elbow grease soon. Orderly engine compartment shows age. A fine and jaunty touring machine. 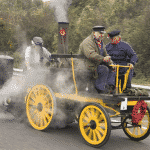 – The cosmetics appear to be older than suggested by the date of the re-restoration but their quality is apparent and are more than good enough to make this antique Benz a pleasure to behold. It is a fine example of its type and at the price it brought it is a good value to the new owner who can spend a lot on Brasso and Never Dull without going underwater. 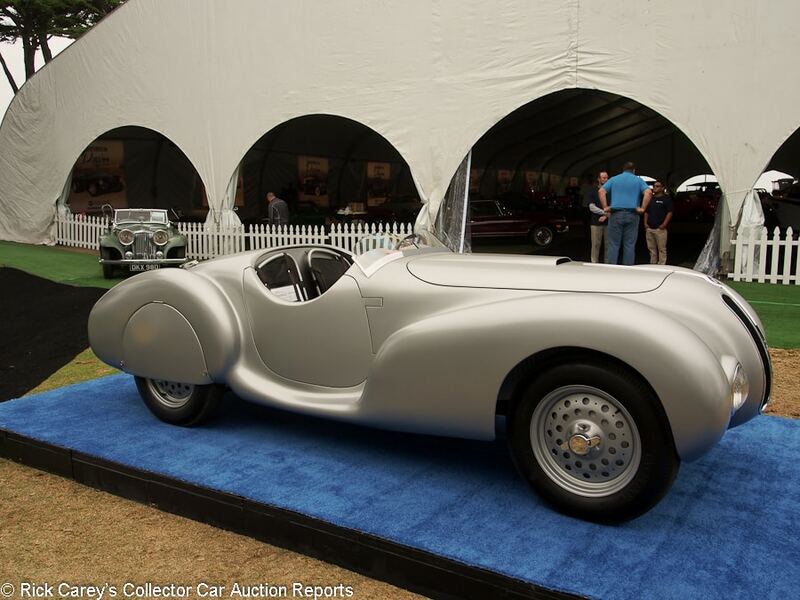 Lot # 44 1940 BMW 328 Roadster, Body by After Touring; S/N 85133; Silver/Black leather; Estimate $1,500,000 – $2,000,000; Rebodied or re-created, 1 condition; No Reserve; Hammered Sold at $550,000 plus commission of 10.00%; Final Price $605,000. – Dry sump BMW engine, centerlock alloy wheels, Excelsior tires, sling seats, full width windscreen, skirts. – Represented as one of the original Touring bodies in this style known as ‘Torpedino Brescia’ on AAV and Alfa Romeo chassis, built for BMW for the canceled 1939 Mille Miglia. Restored on this chassis by Fran Roxas to unusually high standards. Carefully dulled paint, good interior and chrome. Underbody and chassis are like new. – Is this the reunited chassis and body intended for the ’39 Mille Miglia? That’s the question and the fact it can’t be answered definitively is reflected in this price but by any standard it is a huge value in this transaction, if only for the spectacular Fran Roxas restoration. 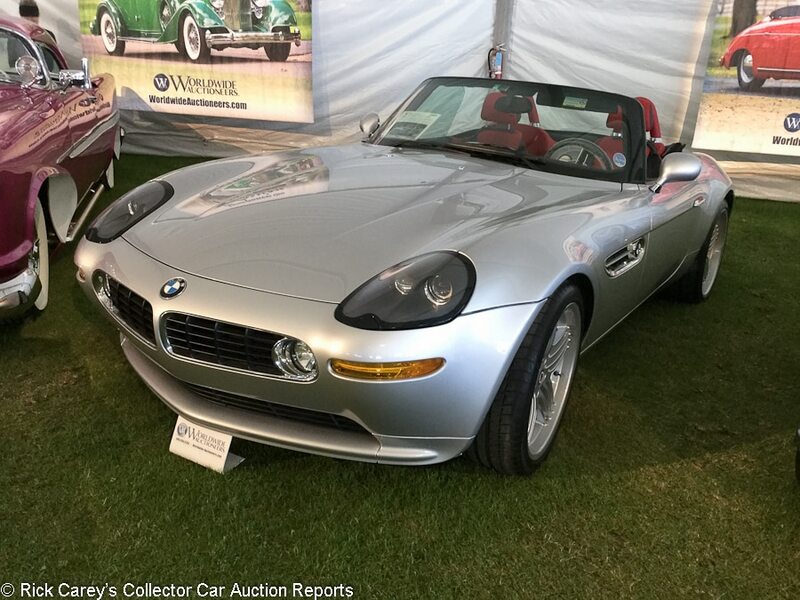 Lot # 73 2003 BMW Z8 Alpina Roadster; S/N WBAEJ13413AH62520; Titanium Silver Metallic/Red; Estimate $225,000 – $275,000; Unrestored original, 2 condition; With Reserve; Hammered Sold at $212,500 plus commission of 10.00%; Final Price $233,750. – Alpina wheels, power windows, air conditioning. – Excellent paint. The driver’s seat is slightly stretched. Represented with 3,998 miles. A nearly new car. – Bid to $180,000 on the block and closed later with this result. The Alpina version of the Z8 was actually tuned to have more low-down power and be more of a fast cruiser than an all-out sports car. Only 555 were built and they are both rarer and more valuable than the factory Z8. While some have brought well over 200 grand at auction, others have brought closer to this result. 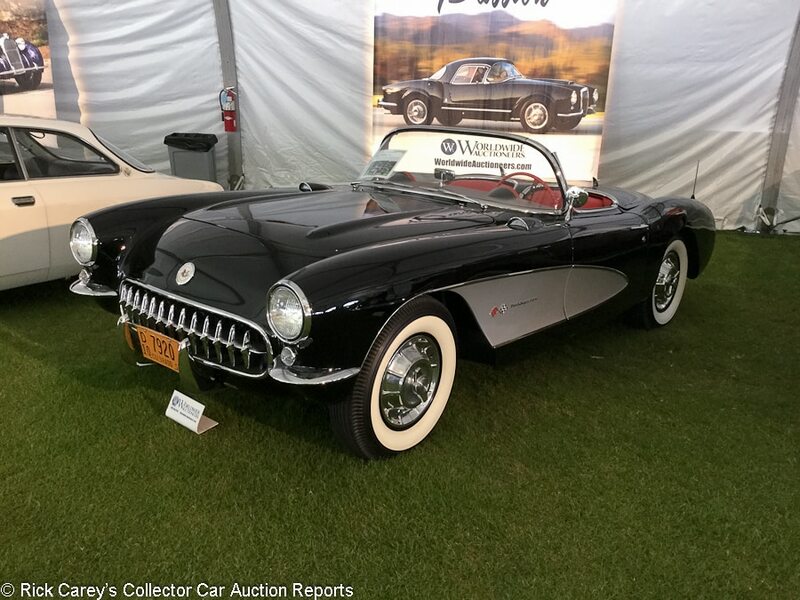 Lot # 11 1957 Chevrolet Corvette FI Convertible; S/N E57S102166; Onyx Black, Inca Silver coves/Red; Black top; Estimate $125,000 – $150,000; Recent restoration, 2+ condition; With Reserve; Hammered Sold at $114,000 plus commission of 10.00%; Final Price $125,400. – 283/283hp Fuelie, 4-speed, power top, wheel covers with whitewalls, WonderBar radio, power windows. – Gorgeous paint and body. The mechanicals have all been restored to the smallest detail and the underbody is immaculate. The interior looks unused. A beautifully restored first-year Fuelie Corvette with few miles since completion, nothing consequential to pick on and several rare and desirable bits of equipment. – Including the rare power top, one of 1,336 sold with this option and surely one of only a handful of 283/283 Fuelies with it. 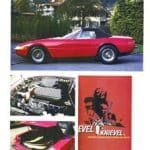 Meticulously restored and unusually equipped with luxury options, this is an outstanding Corvette and it brought a price that is a good value for its condition and equipment. Lot # 64 1962 Chevrolet Corvette FI Big Brake Convertible; S/N 20867S108295; Sateen Silver, Silver hardtop/Black; Estimate $130,000 – $160,000; Recent restoration, 2 condition; With Reserve; Not sold at Hammer bid of $100,000. – Fuelie, body color wheels with hubcaps, radio and heater delete, hardtop. – Very good paint. The trunk lid is slightly misaligned. The bumpers shine like new, but the stainless trim on the hardtop is a bit faded. The engine compartment is very clean and the underbody is like new. The interior looks fresh and unused. Restored two years ago and said to have been driven only 30 miles since, during the preview, a few mechanics were busy sorting out the fuel injection system. Advertised as show-ready but hasn’t been displayed at any major events yet. 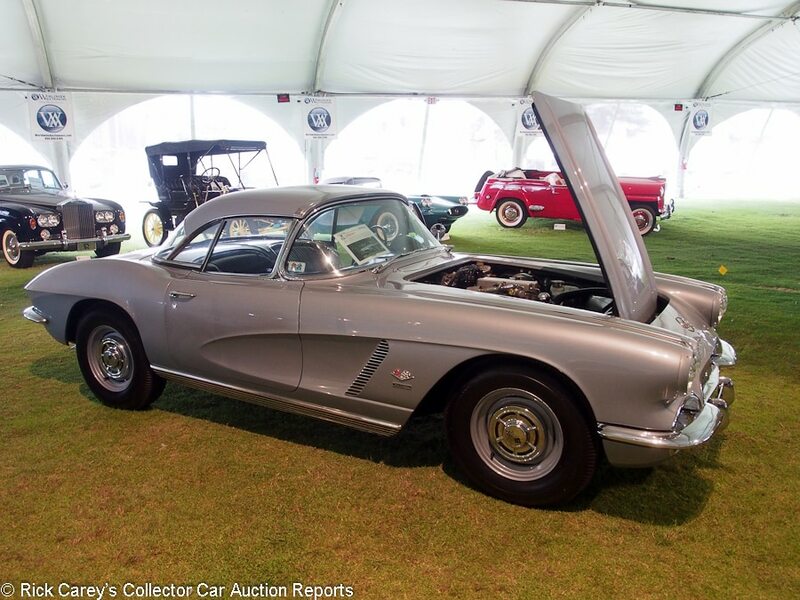 – The FI troubles were obvious to everyone at the Pacific Grove auction, an unfortunate situation that affected bidders’ willingness to step up for this otherwise high specification Corvette and a good reason for the consignor to take it home and sort out the engine so it runs as well as it looks. 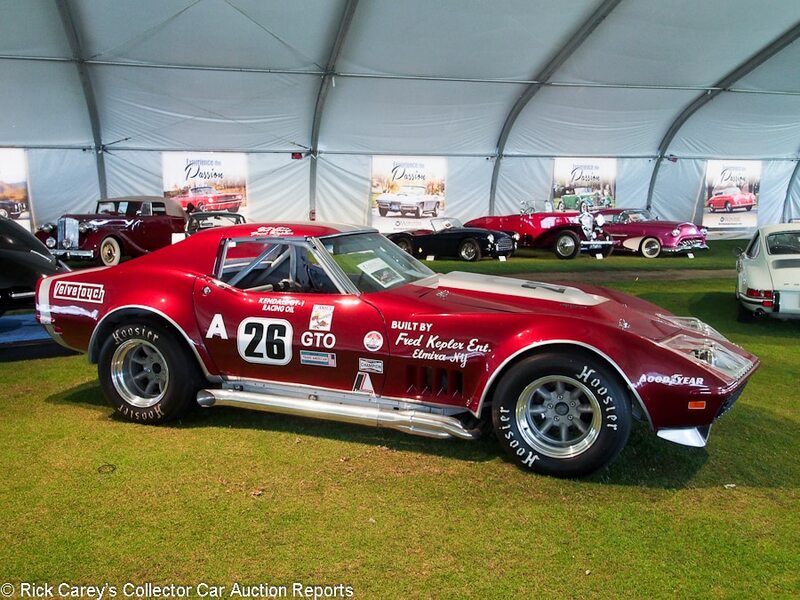 Lot # 65 1968 Chevrolet Corvette L88 Coupe Race Car; S/N 26037; Metallic Red, White accents/Black; Estimate $300,000 – $400,000; Competition restoration, 3 condition; With Reserve; Not sold at Hammer bid of $150,000. – L88 427, mag wheels with Hoosier race tires, chrome side pipes, raced in IMSA, SCCA Trans Am and A/Production series, documented with Fred Kepler’s and Tom Rynone’s period logbooks. – The paint is a bit faded with some light scratches. The brightwork is faded and scuffed. The underbody is clean and has little deterioration. The stripped down interior is clean and has appropriate wear. A well kept, yet used race car. Built by Fred Kepler in 1972 by upgrading an L71 car to L88 specs. Restored in 2000 after a long and successful racing career and has since been a vintage racer at places like the Monterey Historics since then. Probably race-ready. – Fast Corvettes were not in favor in Pacific Grove today and this proven and successful vintage racer escaped the bidders’ notice with a bid that’s plainly insufficient for this car’s history, performance potential and quality presentation. 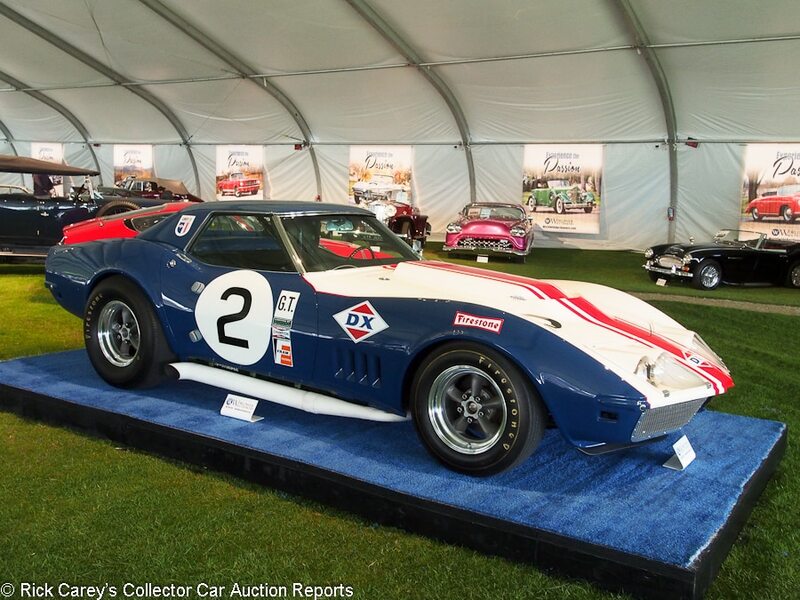 Lot # 59 1968 Chevrolet Corvette L88 Sunray DX Race Car; S/N 194678S402351; Blue, White/Black; Estimate $950,000 – $1,250,000; Competition restoration, 2+ condition; With Reserve; Not sold at Hammer bid of $600,000. – L88 427, power brakes, side pipes, mag wheels with Firestone Wide Oval tires. Upgrades performed by Don Yenko. – Excellent paint, body and bright work, the engine and mechanicals have all been redone to the highest standards, the interior is immaculate with high attention to maintaining the car’s history. Very little use is noticeable since the 2004 restoration. 2nd in class 1968 24 hours of Daytona, GT class lap record 1968 Sebring 12 hours, 1968 SCCA Midwest Division road racing title with Don Yenko. Restored by Kevin MacKay, NCRS American Heritage Award, Bloomington Gold Special Collection. A gorgeous L88 with a fantastic story to go with it even if it isn’t the most successful of the L88s. – Not sold at Barrett-Jackson Scottsdale 2015 at a $1.1M high bid and no surprise it didn’t sell here at barely half as much. 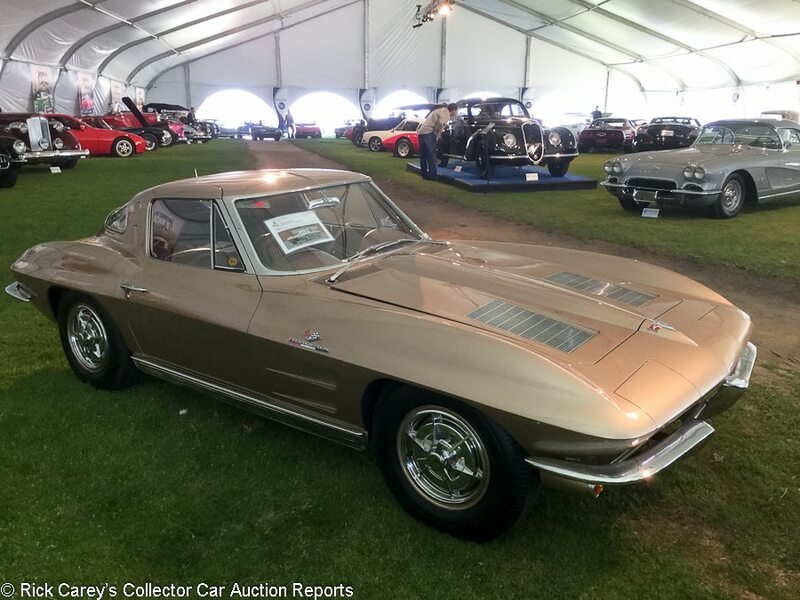 Lot # 19 1963 Chevrolet Corvette Z06 (big tank) Coupe; S/N 30837S109324; Fawn Beige/Saddle leather; Estimate $400,000 – $500,000; Older restoration, 2- condition; No Reserve; Hammered Sold at $325,000 plus commission of 10.00%; Final Price $357,500. – Big fuel tank, power brakes, wheel covers, WonderBar radio, power windows. Bloomington Gold certified and NCRS Top Flight. – Good older paint. Very good brightwork. The engine compartment has some aging and the underbody shows minor use. The interior has little wear. A very attractive Tanker Z06 that has been used sparingly since being restored in the 1990s. Raced briefly by a young woman in the Northeast until her father found out and put a stop to it. – Sold by Gooding out of the Otis Chandler collection in 2006 for $330,000, then not sold at Worldwide Scottsdale back in January of this year at a $440,000 high bid. Especially given the money offered in Scottsdale, the seller here can’t be happy with this no reserve transaction. The buyer, on the other hand, now has a perfectly good if somewhat aged Z06 Tanker for tens of thousands of dollars under market value. 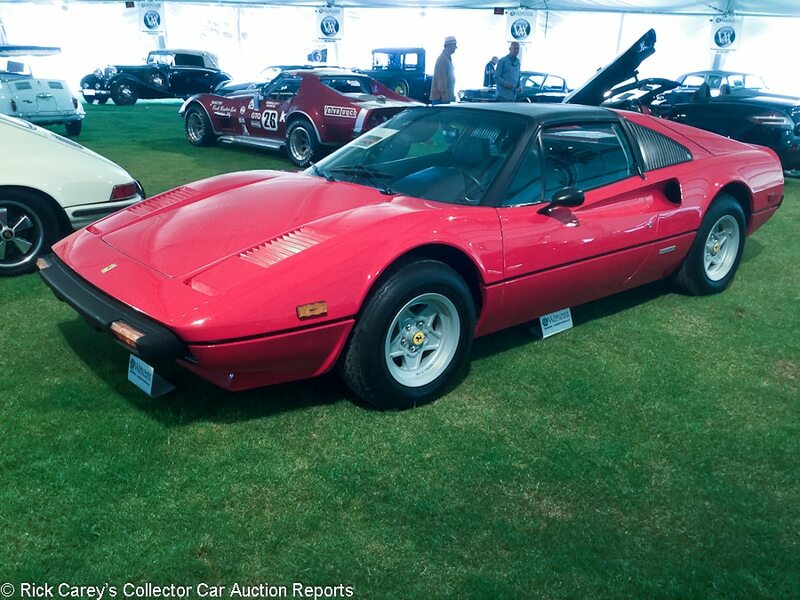 Lot # 17 1979 Ferrari 308 GTS Spider, Body by Pininfarina; S/N 28663; Rosso Corsa/Black leather; Estimate $115,000 – $145,000; Unrestored original, 2- condition; With Reserve; Not sold at Hammer bid of $97,500. – Air conditioning, Blaupunkt radio, power windows. – Represented with 1,600 original miles. Some paint is cracking behind the passenger’s door and the finish in general is fading across the car. The engine compartment is immaculate and the interior appears unused. Detailing and mechanical work finished earlier this year, including a belt service. While the paint is a bit rough given the mileage, the remainder is beautiful on this low mile 308. – Even if the paint on this otherwise very good low-mileage carbureted 308 were much better, the reported high bid was a fair offer. 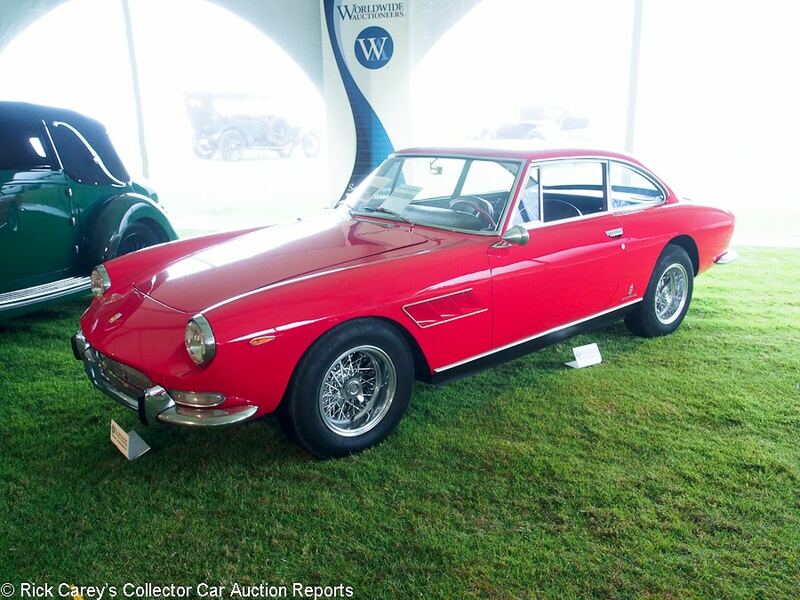 Lot # 47 1966 Ferrari 330 GT 2+2 SII Coupe; S/N 08871; Red/Black; Estimate $325,000 – $375,000; Unrestored original, 3- condition; With Reserve; Not sold at Hammer bid of $260,000. – Borrani wire wheels, power windows, Becker Europa radio, woodrim steering wheel, aftermarket air conditioning, documented by Marcel Massini. – Paint is cracked lightly across the entire car. There are pant chips along the edge of the trunk lid and driver’s door edge. The windshield has a stone chip in it. The engine compartment is clean and has little aging and the interior is well kept with some creasing to the driver’s seat. Showing 86,748 but the engine was reportedly rebuilt nine years ago at 82,000 miles. A rather lackluster car now but a solid restoration candidate. – With an abundance of Ferrari choices in the Monterey auctions even originality doesn’t mean this 330 GT 2+2 couldn’t have been sold for the reported high bid. 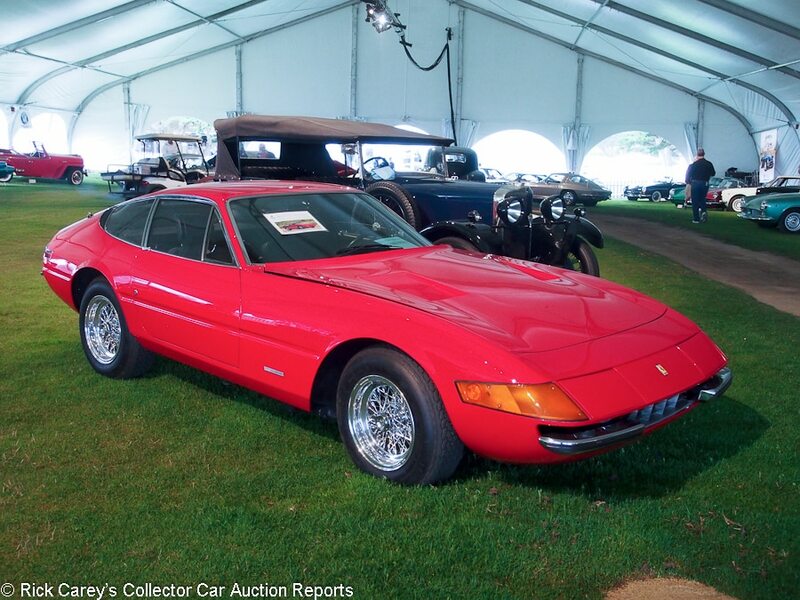 Lot # 32 1971 Ferrari 365 GTB/4 Daytona Berlinetta, Body by Pininfarina-Scaglietti; S/N 14393; Red/Black leather; Estimate $700,000 – $800,000; Cosmetic restoration, 3+ condition; With Reserve; Not sold at Hammer bid of $610,000. – Borrani wire wheels, AM/FM radio, Ansa exhaust, Ferrari Classiche certified and documented by Marcel Massini. – Shiny paint with some repaired chips on the passenger’s side wheel arch. Clean engine bay and underbody. The interior is surprisingly aged compared to the rest of the car with wrinkled seats, aged radio controls and console area. Cosmetically restored in the 1990s and represented with a recent major mechanical sorting and servicing. A solid driver that needs interior work to make up for the exterior. 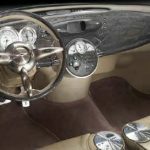 – Hammered not sold at $540,000 at Bonhams Scottsdale this year. Refusing that bid was understandable, and while the number offered here is still a bit light, it was worth giving serious consideration. 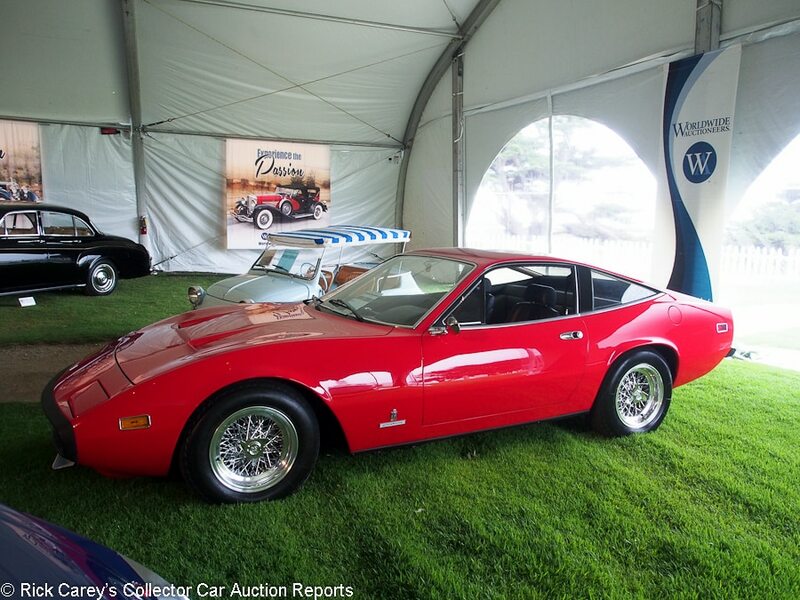 Lot # 41 1972 Ferrari 365 GTC/4 Coupe, Body by Pininfarina; S/N 15359; Rosso Cherry/Black leather; Estimate $225,000 – $275,000; Older restoration, 2- condition; With Reserve; Hammered Sold at $186,364 plus commission of 10.00%; Final Price $205,000. – Borrani wire wheels, Blaupunkt radio, power windows, documented by Marcel Massini. – Very good paint with a few swirls. Very good brightwork. The engine bay shows slight signs of age and the interior is mostly good with some wrinkles to the driver’s seat. An excellent driver quality car. Restored in the 1980s, but serviced recently. Showing 51,715 miles. An attractive, slightly better than driver quality GTC/4 – Bid to $86,900 at Russo and Steele Monterey in 2011 and $275,000 at Russo and Steele Monterey in 2015; Bid to $175,000 on the block, closed later with this result, a modest price for a good car. 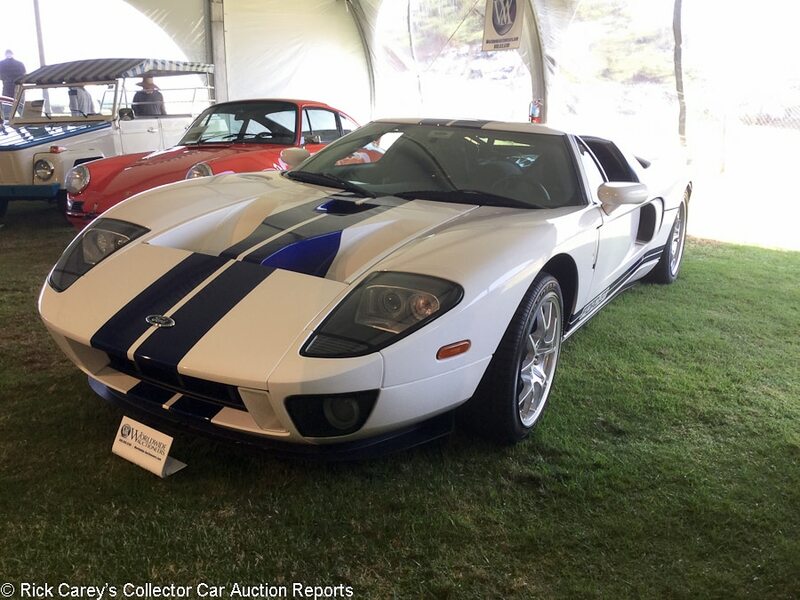 Lot # 55 2006 Ford GT Coupe; S/N 1FAFP90S56Y401412; White, Blue stripes/Black; Estimate $270,000 – $320,000; Unrestored original, 2+ condition; With Reserve; Hammered Sold at $254,000 plus commission of 10.00%; Final Price $279,400. – Upgraded with the Ford Racing power upgrade kit, single ownership, complete with delivery documentation. – Excellent paint and body. Like-new interior. A practically new car even though the 3,730 advertised miles is relatively high in the Ford GT world. – The mods on this car are limited to a different pulley for a blower that gives a bit more power, and it was a warranty-approved upgrade. Even so, it’s not factory original and that combined with this car’s ‘high’ mileage produced this light but still fair result. 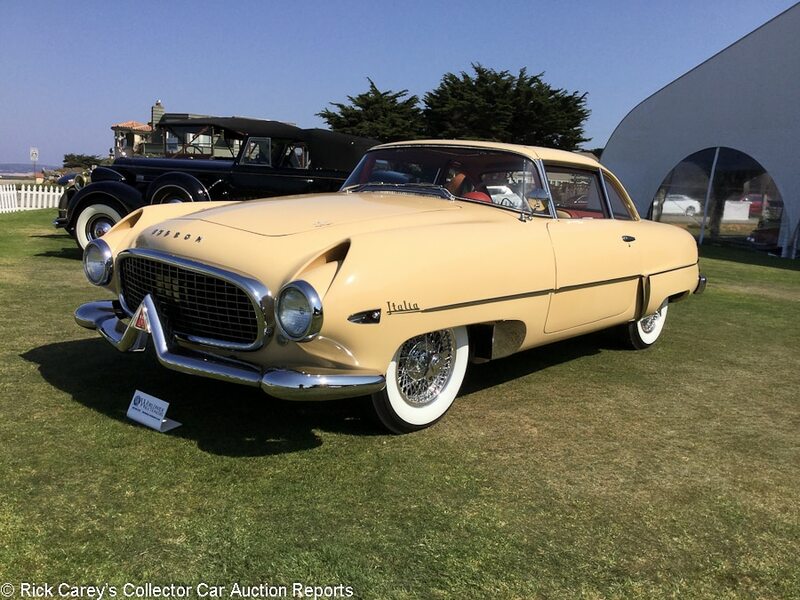 Lot # 15 1955 Hudson Italia Coupe, Body by Touring; S/N IT10010; Tan/Maroon, Tan; Estimate $400,000 – $500,000; Recent restoration, 2- condition; With Reserve; Not sold at Hammer bid of $350,000. 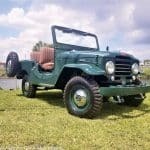 – 202/114hp Twin-H, 3-speed, Borrani wheels, AM radio, bucket seats. – Very good paint and brightwork. Thick repaint to the mechanicals and underbody. The interior has seen little use since restoration and has few signs of wear. An interesting, seldom seen car. One of 26 built. Recently restored, but not quite to concours standards. – Only one Italia has sold at auction for more that the reported high bid here and while it was several years ago it was sold on a bid only ten thousand dollars more than this, and it was a better, concours-quality, restoration. The seller could have accepted the Pacific Grove bidders’ judgment with few second thoughts. 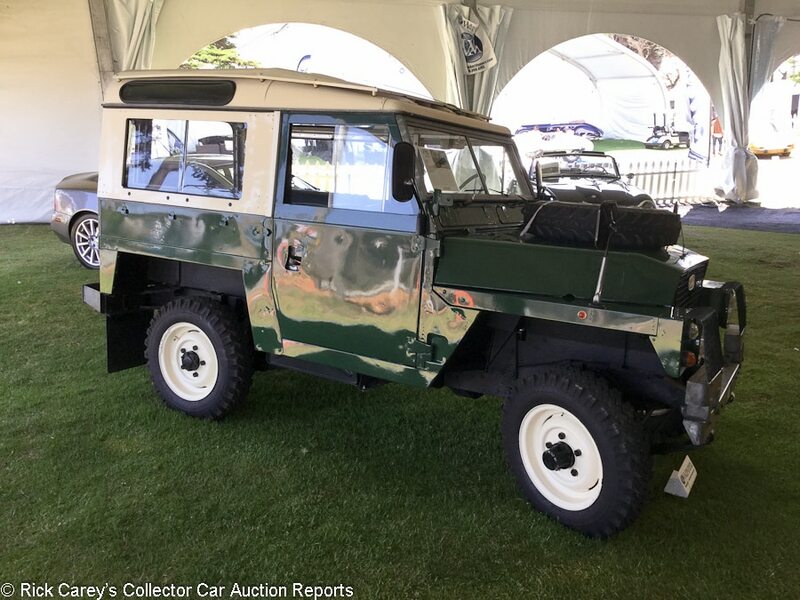 Lot # 72 1978 Land Rover Series III 88 Soft Top 4×4; S/N 95400195A; Bronze Green, Limestone White roof/Black; Estimate $45,000 – $65,000; Visually maintained, largely original, 3- condition; No Reserve; Hammered Sold at $26,000 plus commission of 10.00%; Final Price $28,600. – Overdrive transmission, twin fuel tanks, power steering, original crank handle and tool box, safari roof. – Decent paint with few blemishes. The hood-mounted spare tire is so cracked that it’s unusable for anything other than decoration. The hold down straps are so old they are faded and fraying. The engine compartment is old, dirty and used as well as the underbody. The interior is old and faded yet clean. Showing 42,599 miles. It hasn’t led a pampered life, but it’s still solid and usable. – The fabled off-road performance of the Land Rover probably has been experienced with this one and it isn’t so shiny and pampered that it can’t be experienced some more, particularly at this modest price. 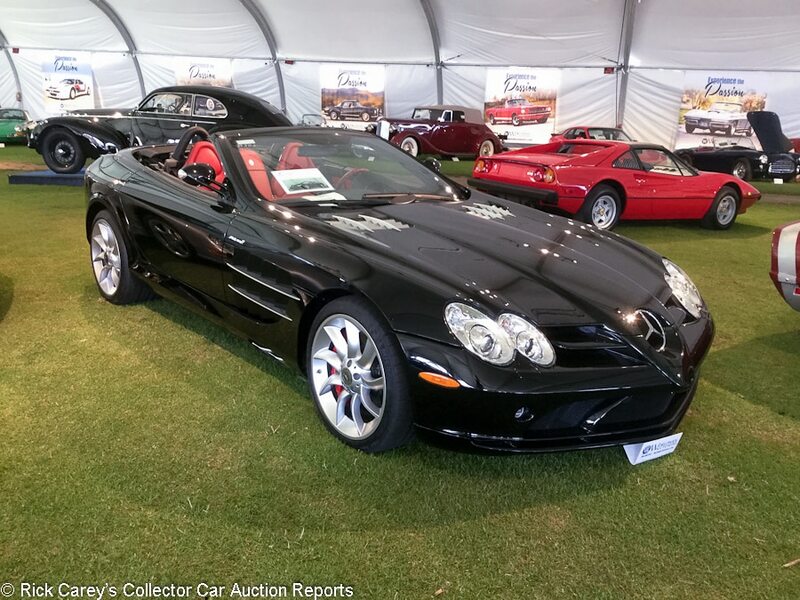 Lot # 21 2008 Mercedes-Benz SLR McLaren Convertible; S/N WDDAK76F58M001562; Black/Red; Black top; Estimate $335,000 – $365,000; Unrestored original, 2+ condition; With Reserve; Not sold at Hammer bid of $270,000. – 5439/617hp, 5-speed, carbon fiber interior accents, single ownership from new. – The paint has some swirling from polishing. The interior and mechanicals are like new. Represented with 3,600 miles and essentially a new car. 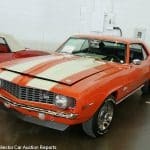 – These aren’t full-blown collector cars yet and remain more in used exotic territory, but at barely more than half its original half-million dollar price, the reported high bid was light and refusing it was understandable although it was bid to $310,000 at Auctions America’s Ft. Lauderdale auction in April. With their butterfly doors, snooty nose and turbine wheels the SLR McLaren owes a lot to rice burner customs. 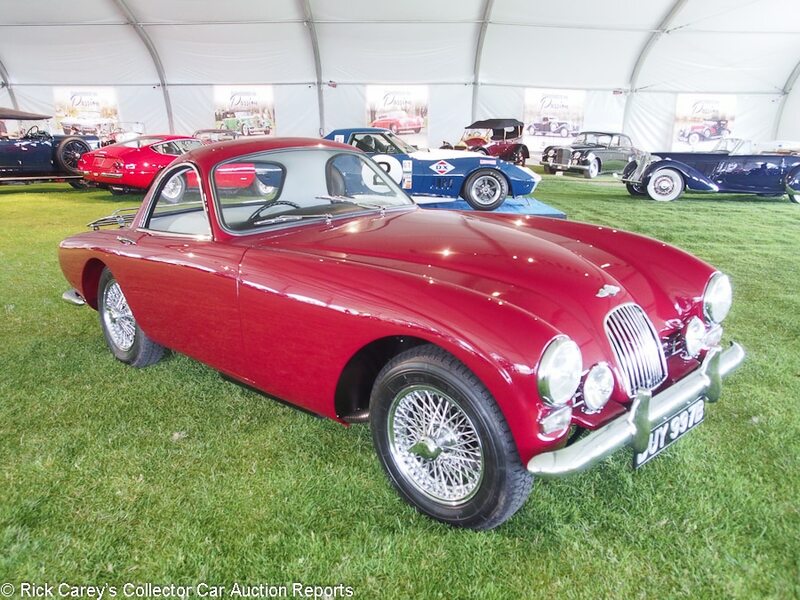 Lot # 57 1963 Morgan Plus 4 Plus Fixed-Head Coupe; S/N A5504; Red/Gray leather; Estimate $175,000 – $225,000; Older restoration, 2 condition; No Reserve; Hammered Sold at $85,000 plus commission of 10.00%; Final Price $93,500. – RHD. 2138/105hp Triumph engine, 4-speed, chrome centerlock wire wheels, Michelin XZX tires, Lucas driving lights, luggage rack, banjo steering wheel. – The shut lines are not very good and the doors stick out at the bottom. Very good paint and chrome. Very good fully restored interior. Spotless underneath. Fully restored about 10 years ago, and shown at concours events including Ault Park and Amelia Island. One of 26 built. A significant example of Morgan’s most notorious yet most collectible model. – Morgan debuted the Plus Four Plus at Earls Court in 1963. This example is the very car that they unveiled, and it has since been restored to fairly high standards in its original colors. Ironically, while the Plus Four Plus was almost universally shunned at Earls Court by the Morgan purists who so dislike any kind of change, it has since become their most valuable production model. This example is either the most famous or the most infamous of the 26 built, depending on how you look at it. The bidders seemed to come down on the side of infamous for this no reserve lot, which brought barely half of Worldwide’s ambitious but realistic low estimate. Lot # 74 1991 Nissan Skyline GT-R Coupe; S/N BRN32015996; Dark Gray/Black; Estimate $35,000 – $55,000; Unrestored original, 2- condition; No Reserve; Hammered Sold at $21,000 plus commission of 10.00%; Final Price $23,100. – Added CD player, upgraded exhaust. – Very good paint and body. The engine is slightly aged yet very clean. The underbody has minimal wear and the interior is well sorted. Showing 82,803 km but looks like a car with much fewer. A very clean R32 Skyline with only a couple tasteful upgrades. – It’s possible that this car was unfairly hurt by its relatively high mileage. Other properly imported examples like this have brought well over twice this amount at recent auctions. Lot # 35 1997 Porsche 911 Turbo S Coupe; S/N WP0AC2991VS375710; Arctic Silver Metallic/Black leather; Estimate $300,000 – $350,000; Unrestored original, 2- condition; With Reserve; Hammered Sold at $265,000 plus commission of 10.00%; Final Price $291,500. – Cassette player, leather seats, sunroof, recent service. – Very good paint and body, the engine is clean and tidy. The door sills have scuffing and the seats do have some creasing. Used sparingly and well maintained for its 43,000 represented miles. 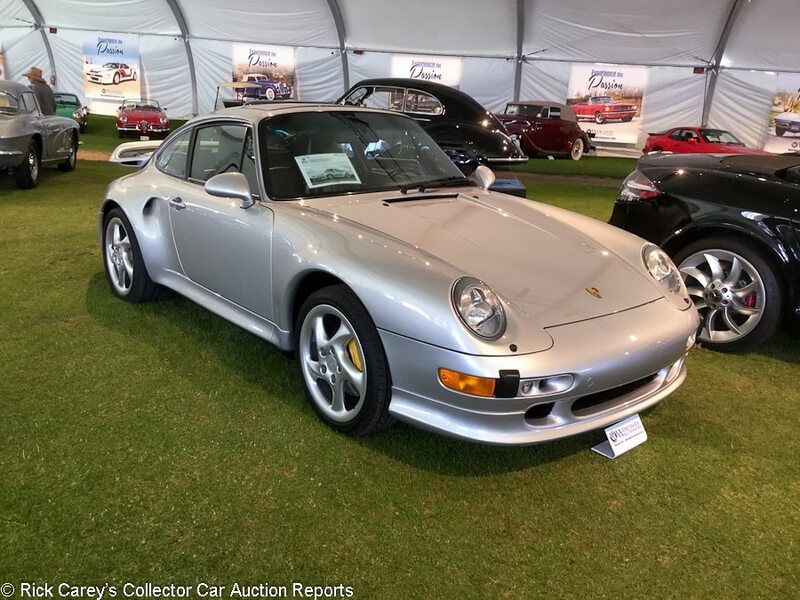 – RM sold a Guards Red 993 Turbo S with 8,300 miles in Monterey this year for $360,250 and this car was bid to $280,000 (which would have been $308K with commission) at Ft. Lauderdale last year. The more mundane color might have something to do with this significantly lower result, but it’s mostly down to the mileage. 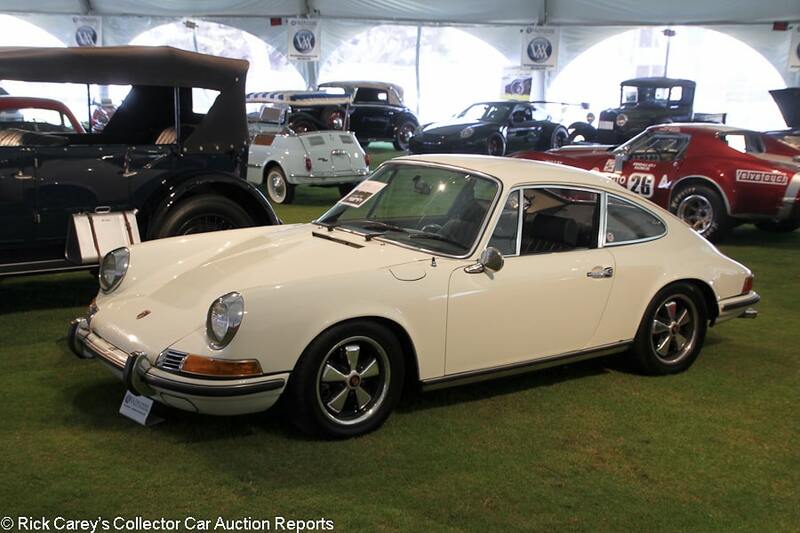 Lot # 29 1969 Porsche 911S Coupe; S/N 119300296; Light Ivory/Black leatherette; Estimate $140,000 – $160,000; Visually maintained, largely original, 2- condition; With Reserve; Hammered Sold at $112,000 plus commission of 10.00%; Final Price $123,200. – 5-speed, Fuchs wheels, Goodyear Eagle Sport tires, Blaupunkt AM/FM pushbutton radio, Dansk exhaust. – Long term West Coast car. Represented as matching numbers. Lightly run but tidy and partially restored engine bay. Two chips on the nose. The right front bumperette is loose. Good paint and brightwork. A few small scratches on the window frames. Very good interior with newer upholstery and carpet. Not perfect, but a maintained and genuine S that anyone could be proud of. Never restored because it never needed to be. – This is a good buy for a 911S as well kept as this. It could have brought a lot closer to 150 grand without being expensive. 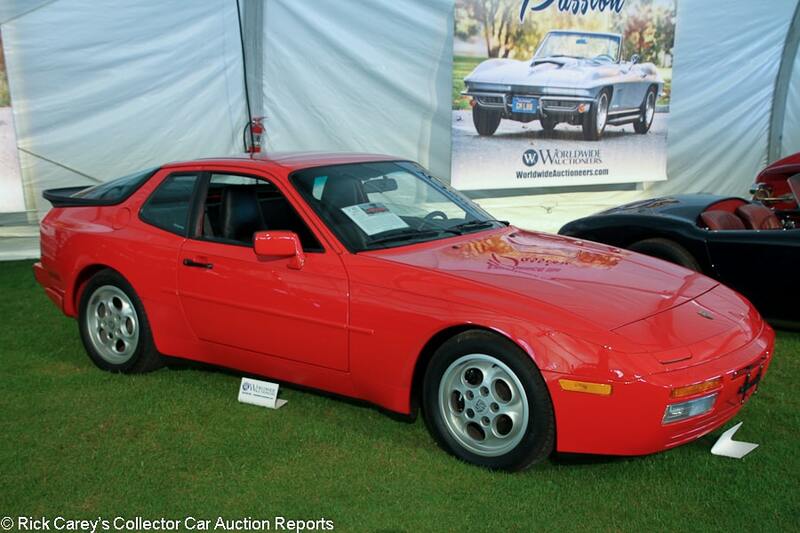 Lot # 4 1987 Porsche 944 Turbo Coupe; S/N WP0AA2957HN153114; Red/Black; Estimate $20,000 – $40,000; Unrestored original, 2 condition; No Reserve; Hammered Sold at $47,000 plus commission of 10.00%; Final Price $51,700. – 5-speed, air conditioning, sunroof, Blaupunkt radio with cassette player. – Showing 1,605 original miles. The paint and body are both factory fresh. The engine is very clean, but the hood struts are weak and require replacement. The interior is unused. Essentially a new car. – Monumental prices for front-engined Porsche have been the trend at auction this year, but only for time-warp examples like this, which is surely monumental. 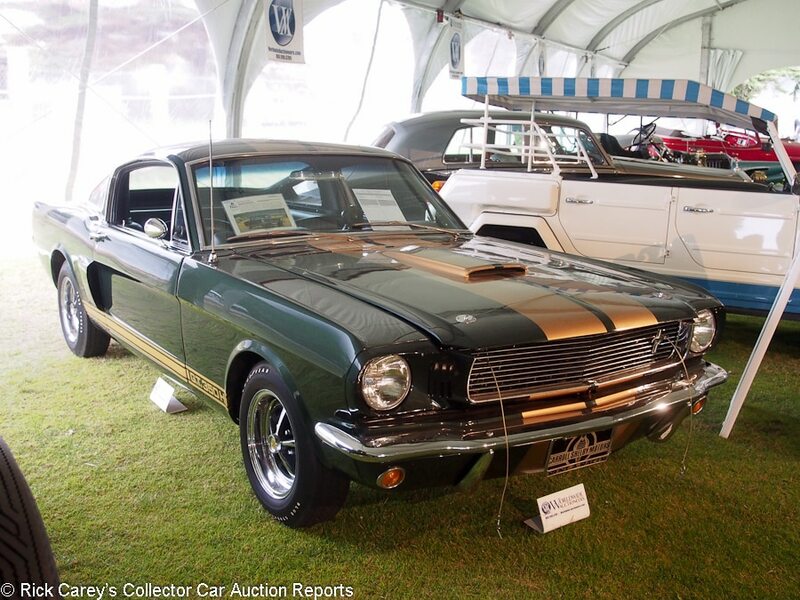 Lot # 67 1966 Shelby Mustang GT350H Fastback; S/N SFM6S1032; Ivy Green, Gold stripes/Black vinyl; Estimate $145,000 – $165,000; Visually maintained, largely original, 3+ condition; With Reserve; Hammered Sold at $122,500 plus commission of 10.00%; Final Price $134,750. – 289/306hp, 4-speed replacing the original automatic, Magnum 500 wheels with Goodyear Blue Streak tires, AM radio, Hurst T-handle shifter, comes with factory invoices. – One of 50 finished in these colors. Presented as an original car. The older repaint is shiny with few notable blemishes. The bumpers are shiny, although the window trim is quite faded and the wheels have light pitting. The engine compartment is clean and appears to have had touch up work. The interior is complete and the glove box and radio face do have some aging. A well preserved original with only a few touches and an old repaint. – There is no originality premium in this GT350. In fact its visible evidence of age may have worked to its disadvantage. It still had its automatic when offered at the Kruse auction in Miami December 30, 1991 when it was reported bid to $28,500. The result today is realistic. 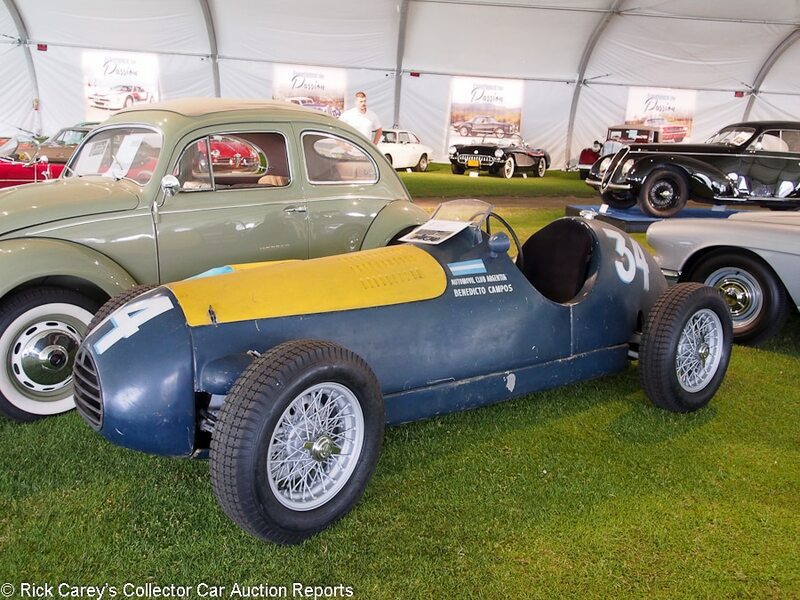 Lot # 24 1948 Simca-Gordini Grand Prix Monoposto; S/N 010GC; Blue, Yellow hood/Black cloth; Estimate $250,000 – $350,000; Competition car, original as-raced, 3- condition; With Reserve; Hammered Sold at $220,000 plus commission of 10.00%; Final Price $242,000. – New silver painted Borrani wire wheels, new Blockley tires, aeroscreen, independent front suspension, four wheel hydraulic drum brakes, Jaeger tach, Smiths engine gauges. – Raced in Europe in 1948 by Prince Bira, Raymond Sommer and Harry Schell, then shipped to Argentina where it was acquired by the local auto club, then sent back to Europe to be raced by Argentine drivers. In Argentina since then. Tired, dull, chipped old paint. Appears to have been mechanically serviced with new wheels and tires. It should be a lot of fun and has some excellent driver provenance. – This early monoposto will be, when it is historic race prepared, eligible for pretty much anything its new owner wants to attend and, even needing work and preparation, is a sound value at this price. 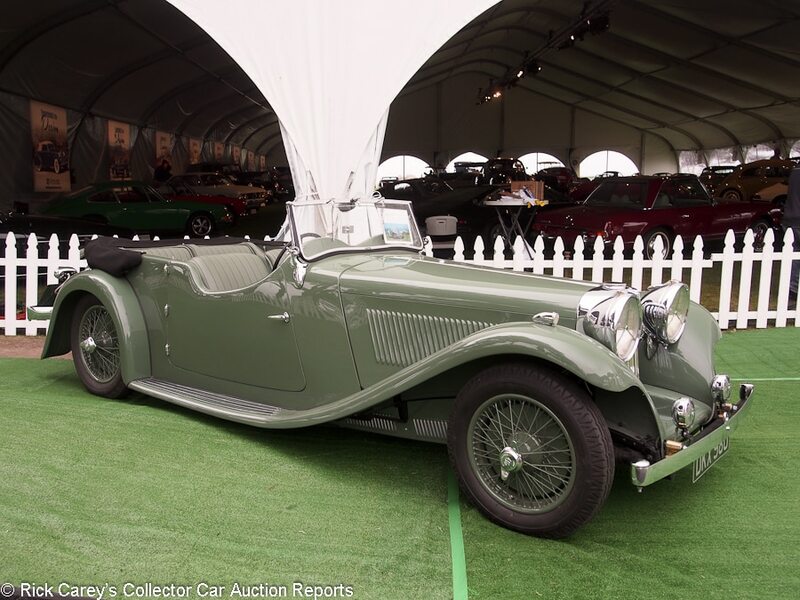 Lot # 49 1937 SS Jaguar One 2 1/2-Litre Tourer; S/N 19098; Suede Green/Suede Green leather; Black cloth top; Estimate $350,000 – $550,000; Concours restoration, 1 condition; With Reserve; Hammered Sold at $300,000 plus commission of 10.00%; Final Price $330,000. – RHD. Folding windshield, body color wire wheels, Firestone tires, single rear spare, rear seat center armrest, Lucas headlights. – Represented as the original engine, chassis, gearbox and body. Freshly done with excellent paint in the original livery, chrome and interior. Underbody and chassis are better than new. A showpiece. – This is 2 1/2 liter SS Jaguar 100 money, a testament to the rarity, style and superb restoration of this car. 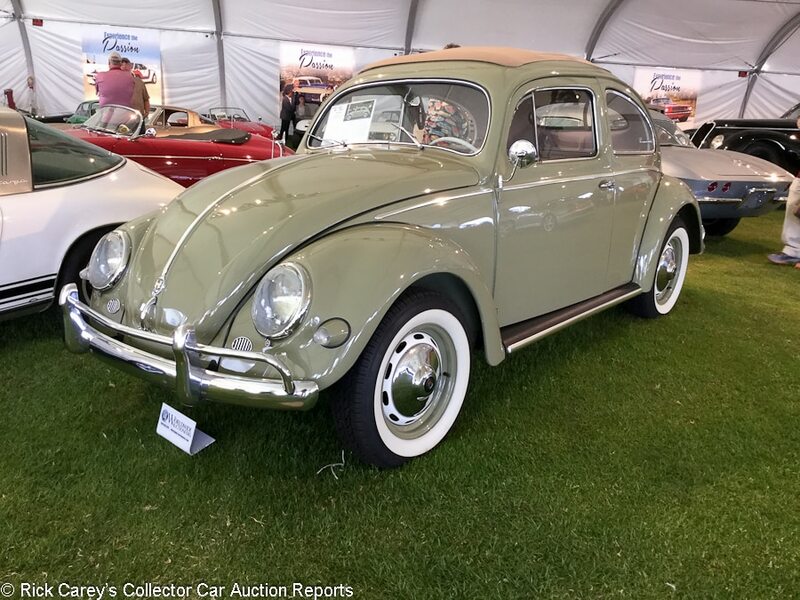 Lot # 37 1956 Volkswagen Beetle 2-Dr. Sedan Sunroof, Body by Karmann; S/N 381002; Light Green, Tan cloth folding roof; Estimate $55,000 – $65,000; Older restoration, 2 condition; No Reserve; Hammered Sold at $70,000 plus commission of 10.00%; Final Price $77,000. – Folding Sunroof, hubcaps, cloth interior, whitewalls. – Very good paint and brightwork. The engine does have a little grime from use. The underbody is very clean and the interior appears unused. A gorgeously restored oval window Beetle with minimal use since completion. – Oval window Beetles can be worth quite a bit, and the ragtop versions like this can be worth even more, but even taking this car’s high quality restoration into account, this was a huge result that was well over Worldwide’s high estimate. 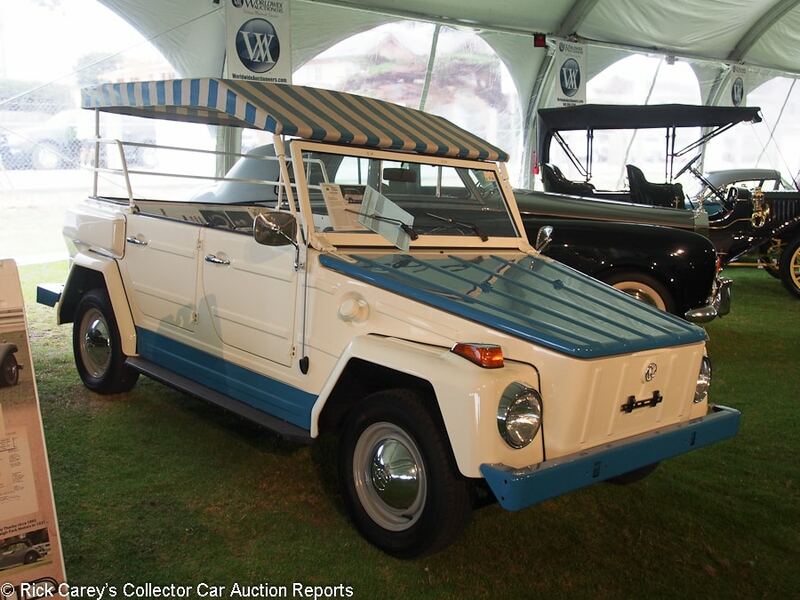 Lot # 66 1974 Volkswagen Type 181 Thing Acapulco Edition Convertible; S/N 1842542277E; White, Blue/White; Blue and White top; Estimate $25,000 – $50,000; Recent restoration, 2+ condition; No Reserve; Hammered Sold at $32,500 plus commission of 10.00%; Final Price $35,750. – Panasonic radio, wheel covers. – Excellent paint and body, well fitted top, freshly redone engine with little use and an unused interior. A recent full body-off restoration. – The blue and white Acapulco Edition VW Things are typically worth a few grand more than a standard 181 Thing, but this was absolutely top end money, especially considering that this very example sold at Barrett-Jackson Las Vegas last year for $24,200. Hello, Rick: I appreciate the coverage of this event. I hate to nit-pick, but it does deserve mentioning that Lot 59, the 1968 Sunray-DX Corvette racing car actually placed 2nd in class at the 24 Hours of Daytona in 1968 as part of the Don Yenko-led Sunray-DX Corvette team’s famous 1-2-3 podium sweep. It was DNF and did not finish 2nd at the next race at Sebring. However, it did set fastest lap there with Yenko and Pedro Rodriguez co-driving. David, Thanks for your comment. The report does say, ‘2nd in class 1968 24 hours of Sebring, GT class lap record 1968 Sebring 12 hours, 1968 SCCA Midwest Division road racing title with Don Yenko.’ That’s pretty much what you said above, although the description mistakenly has it at Sebring twice in 1968, which I have changed.